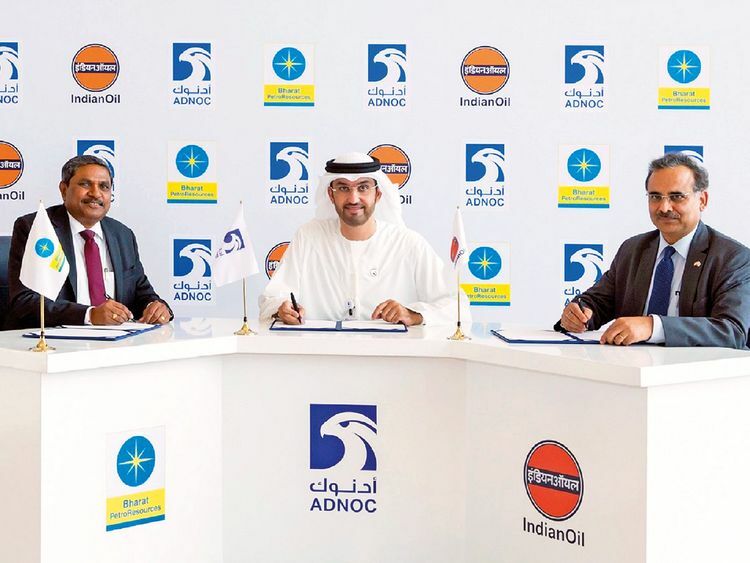 Abu Dhabi National Oil Company (Adnoc) on Monday signed agreements awarding the exploration rights for “Abu Dhabi Onshore Block 1” to a consortium of two Indian oil companies, Bharat Petroleum Corporation Limited and Indian Oil Corporation Limited. In a statement, Adnoc said the consortium will hold a 100 per cent stake in the exploration phase of the project, investing up to Dh626 million ($170 million), including a participation fee, to explore and appraise oil and gas opportunities. Following successful exploration activities and appraisal of the existing discoveries, the Indian consortium will be granted the opportunity to develop and produce any discoveries. Adnoc has the option to hold a 60 per cent stake in the production phase. The agreements, which, collectively have a term of 35 years, were signed by Dr Sultan Ahmad Al Jaber, UAE minister of state and Adnoc Group CEO; Duraiswamy Rajkumar, chairman and managing director of Bharat Petroleum Corporation and Sanjiv Singh, chairman of Indian Oil Corporation. “The consortium of Bharat Petroleum Corporation and Indian Oil Corporation, both of whom Adnoc already partners with offshore, was selected after a very competitive bid round,” said Al Jaber.